Energy Recovery and Dehumidification Solutions. Using heat pipe science and technology, we work with clients to enhance new or existing heating and cooling systems. Carolina Heat Pipe, Inc. has installed many customized applications for industrial, medical, office, and educational facilities across the country. Some of our high-profile installations include The Strom Thurmond Fitness Center, The Medical University of South Carolina, The White House Visitor’s Center, and The Charleston Naval Weapons Station. A Thermosyphon Run Around Heat Pipe (TRAHP™) is an energy-efficient device used to transfer heat from a warm point to a cooler point. 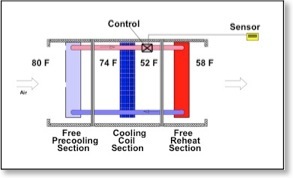 Carolina Heat Pipe’s TRAHP™ is a simple passive reheat system consisting of two uniquely configured Heat Pipe Thermosyphon coils which are positioned on either side of your cooling coil. 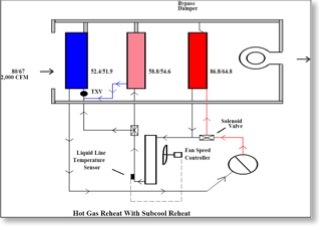 Heat is transferred from the entering side of the cooling coil to the leaving side by means of the natural heat pipe thermosyphon process in which refrigerant boils on the entering side and condenses on the leaving side. A compressor is not used and the only moving part is the control valve. When incorporated into an air handler the TRAHP™ will remove more moisture using less energy while lowering the supply air relative humidity to provide a healthier, more comfortable environment. This system is intended primarily for direct expansion systems. It features Humidity Control, Total Part Load Performance, Energy Efficiency, Controllable Hot Gas Reheat, Passive Reheat, Subcool Reheat Option, and is Neutral BTU Ventilation capable. The Subcool Reheat of refrigerant for improved dehumidification uses the cold supply air to cool the liquid refrigerant before it enters the evaporator coil. This process is called “Subcooling.” This process increases the moisture removal capability of the Air Conditioning System and passively reheats the supply air to introduce cool, drier air into a building. Properly installed, a Subcool Reheat system will improve the moisture removal while lowering the relative humidity of the supply air served by an Air Conditioning System. 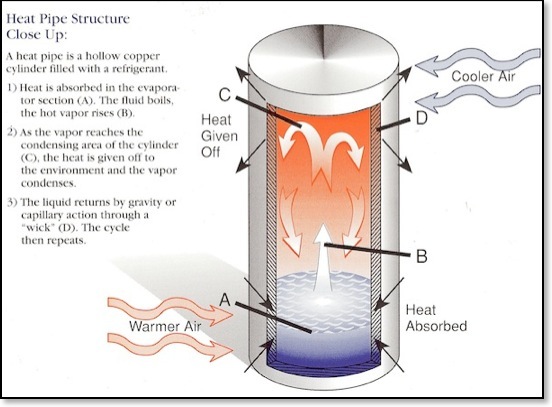 Carolina Heat Pipe’s Patented Split System Thermosyphon Run Around Heat Pipe (TRAHP™) brings a new capability to the use of heat pipe science for energy recovery. By consolidating the performance of multiple heat pipes with interconnecting run-around headers, Carolina Heat Pipe Inc. can transfer heat without location restrictions imposed by conventional heat pipe systems. This TRAHP™ development allows us to provide SPLIT SYSTEM heat pipes for heating, ventilating and air conditioning systems. Now a system designer can stretch, turn, separate and maneuver the heat pipe transfer surfaces to strategically place them where wanted. This new development eliminates earlier conventional heat pipe placement restrictions for multiple bent heat pipes or side-by-side air duct locations. Also because split system TRAHP™ heat transfer surfaces are separated by refrigerant charged headers, the heat transfer process can be controlled with an on-off signal or a modulating signal from a modern control system. Manufacturer : Carolina Heat Pipe Inc.